For a simplified version of this post, check out our Synthetic Gemstones Infographic. Gemstones have many valuable applications, from communication and laser technology to--of course--affordable and beautiful jewelry. The complex formation of natural gemstones occurs over millions of years, but by understanding the chemical makeup of gemstones, we’ve been able to manufacture lab-created gemstones to mimic the real thing since 1902 when the ruby became the first-ever synthetically created gemstone. Since then, man-made stones have been on the rise. Today, we will examine the ways in which gemstones can be made in a lab and talk about two specific methods that are most common in the industry. 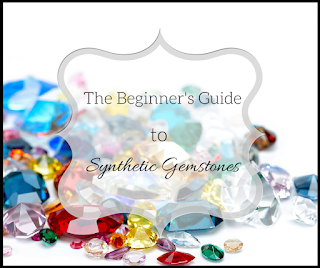 This is the beginner’s guide to synthetic gemstones. Synthetic gemstones are equal to their natural counterparts in appearance and chemical makeup and are virtually indistinguishable from the real thing unless closely examined under a microscope. Because gemstones that are created in the lab cannot possess the same rarity or value as a natural stone, there are strict guidelines to how they can be marketed and sold. Synthetic gemstones produced in the United States include alexandrites, diamonds, emeralds, rubies and sapphires, just to name a few. Synthetic stones must be labeled as synthetic, and it is against the law to sell man-made stones under false pretenses. But how do these lab-made beauties come into existence if not through millions of years of intense temperature and crushing pressure? Lab stones can be manufactured using several methods: Most commonly, these are the “melt” and “solution” techniques. For the melt process, a chemical mixture that has the same chemical composition as the resulting crystal is needed. The mixture is--you guessed it--melted, and then cooled in a controlled environment allowing large crystals to grow. 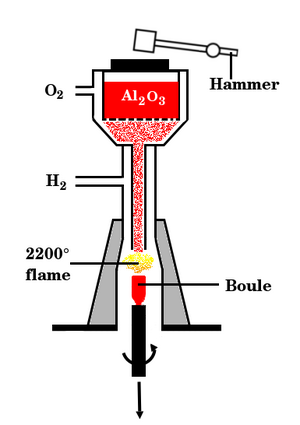 The most common melt method used today is referred to as flame fusion or the Verneuil process. The Verneuil process is the same process used in 1902 to produce the first man-made ruby and is still used to produce most of the synthetic rubies and sapphires you’ll find today. Flame fusion uses a process in which powdered chemicals, such as highly purified aluminium oxide, the chemical component of both rubies and sapphires, are slowly sifted through a high-temperature flame to melt and collect slowly on a rotating pedestal. This collection is referred to as a “boule”, which normally reaches about 150 – 200 carats in size before it is cooled. The cooling process results in internal pressures that will fracture the gemstone so it’s necessary to continually split the stone to avoid it breaking. While gemstones created using the Verneuil process are a chemically equivalent to their naturally occurring counterparts, a Verneuil crystal can be identified under a microscope because it contains curved lines that are created as the dripping chemical layers grow upward to create the boule. Flame fusion remains one of the cheapest methods for crystal production, and it is estimated that 90% of the artificial production of synthetic rubies and sapphires is accomplished using this method. Generally speaking, solution processes are more costly and time-consuming than melt methods, and the resulting gems are more expensive because of this. However, solution methods will also result in higher-quality stones, which makes the process well worth it. Unlike with the melt method, the mixture used for this process will consist of a chemical solution that is different than that of the resulting crystal. The process occurs when the constituents are dissolved at high temperatures and then cooled to slowly form crystals. A highly common solution method for gemstone creation is the flux-growth process. Flux, in this case, refers to the material that is used to dissolve other materials. 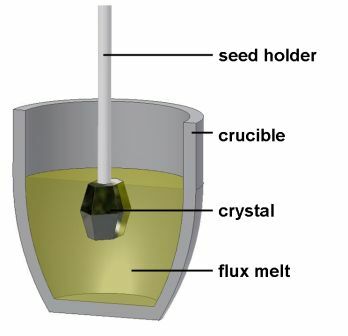 This method uses a container called a crucible, in which the constituents for the desired crystal along with their flux are heated to slightly above the saturation temperature. The crucible is then cooled which allows the solution to undergo the process of precipitation until the solution is gone or the reaction is artificially stopped. This method of growing gemstones can take up to a year, and the equipment used is much more expensive than what is needed for any melt process. Additionally, the gemstones produced in this manner are comparatively small. However, the natural-looking inclusions that result in gems using solution methods are well worth this time. Most commonly, this method is used for synthetic emeralds. These are just two of the ways in which synthetic crystals and gemstones can be created. Among the solution and melt methods, there are many more worth exploring. If you love gemstone trivia and would like to share some facts with us, comment below. We’d love to hear from you!